During our almost three years of farming in Enumclaw, WA, we began building a herd of dairy cows for our family dairy. 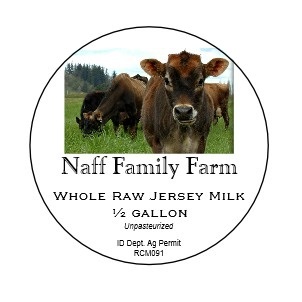 Here in Idaho we have a permit to sell our whole, raw milk from our pastured dairy cows. We have built our herd of friendly, healthy cows, (Brown, Swiss, and Jersey), with a focus on breeding for A2 genetics for the healthiest milk. For more information on the health benefits of raw milk, visit www.realmilk.com. For more information on A2 genetics and milk protein, read, "A2 milk – What is it all about?" Contact us to sign up for delivery of milk and milk products.